Rocklands currently has a small playground on the playing field off Green Lane. This was installed in 2000 and has two sets of swings, a trim trail and some balance bars. After a summer of visiting other local playgrounds we thought it would be a great idea to try and improve and update ours. 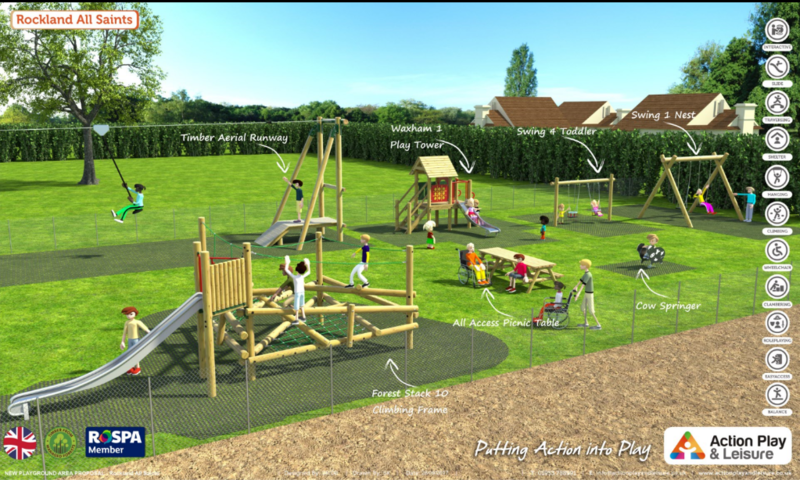 We wanted somewhere that would appeal to everyone and we wanted as many people as possible from the village to contribute and have their say about what their playground should look like. We consulted with the local school, play group and youth club and we distributed over 150 leaflets throughout the village, as well as putting up posters, welcoming comments and feedback. All of this information was considered and put together in a plan that we feel met as many of the needs and requests as we could, but also within a budget and time frame that was achievable. The consultation showed that the village was in agreement, the playground needed improving. 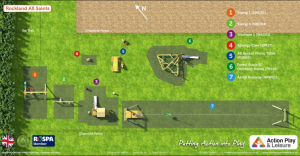 It highlighted a large amount of people travelled out of the village to use other parks, stating “there is not enough equipment in ours”, “nothing for older children”, and “nothing for younger children”. Villagers felt a new park would “benefit the village as a whole” allowing residents to “socialise”, “improve health,” “spend time outdoors” and “with their family”. The village felt the park would support the community, make it stronger and improve general well being. 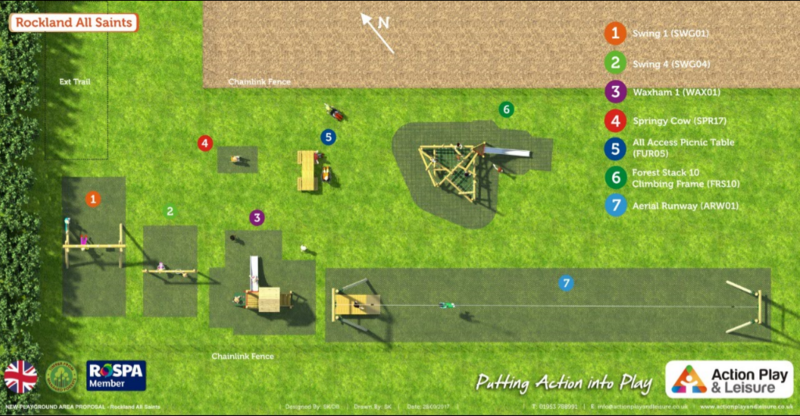 So we could think of no better name than the Rocklands Community Playground! The project will cost £33,530 in total and we hope to raise this through fund raising, donations and applicable grants. For the younger children (2-5yrs) there will be a small climbing frame with slide, a play bus, shop front and two springers. For the older children (5-15yrs) there will be a log pile climbing frame with slide. There will also be a zip wire (2 years +) and nest swing (1 year +) to be enjoyed by all (including the adults!!). There will also be picnic benches, so there is somewhere to sit and relax and hopefully encourage friends and families to meet, picnic and use the area. There is currently a group of villagers that meet every few weeks to put together ideas of ways to take this project forward, if you would like to join in, simply share an idea, comment or make a donation then please get in touch. In January we were very excited to receive a grant from Norfolk Community Foundation of £5834. This will purchase our first piece of equipment, the zip wire! The next meeting will be held at the White Hart in Rocklands on the 7th of March at 7.30pm, or you can contact us directly Kirsty 483833 or Laura 488959. We will update this site with our progress and any fundraising events we will be hosting.